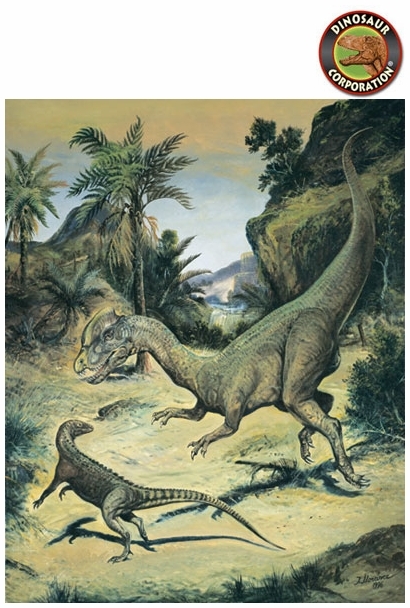 Dilophosaurus and Scutellosaurus. Illustration by Josef Moravec. Original Oil painting 20" x 16" (51 cm x 41 cm). (Framed). Dilophosaurus wetherilli is considered to be a ceratosaur, the earliest and most 'primitive' of the theropod groups. It was made famous in the movie "Jurassic Park", but real Dilophosaurus was much larger, and there is no evidence, it had neck frills or poison glands. This medium-sized theropod was the largest predator in its environment, a powerful meat-eating animal, that ate smaller plant-eating dinosaurs. It was probably a group animal, since three specimens were found together in Arizona, USA. Dilophosaurus was quick and probably moved around in small herds of family groups, covering a lot of territory. Dilophosaurus was a predator with a very unusual skull. It had a pair of semicircular bony crests, that rose vertically on either side of the skull. These crests were very thin in places and were given support by vertical struts of bone. The tip of each crest narrowed into a spike at the back of the skull. The significance of the crests is still unknown; they probably served dual purposes: as mating displays and as heat radiators to cool the blood and brain, allowing to pursue prey in hot environments. This effective desert predator was a speedy, slender and bipedual (walked on two muscular legs), leaving bird-like footprints on land. Body about the weight of a small horse with long, strong hind legs with four-toed feet, short forelimbs with three-fingered hands that were flexible, with an opposable thumb. Its hind legs, feet, were armed with very powerful claws, that were probably used as weapons as well as for locomotion. Dilophosaurus was probably a very rapid runner. It was carnivore, but it had loosely attached jaws which would have made killing animals with its teeth difficult. It must have killed with its clawed arms and legs. TIME - 208 - 194 MYA, Early Jurassic period. SIZE - Juvenile 20ft (6m) long. Scutellosaurus, the "little shield lizard", so named because of the more than 300 little bony spikes (scutes) which guarded its back, sides and tail. This tough little creature (only about 13 ft. long) was sometimes compared to modern-day armored cars, so protective was its outer body. Any meat-eating predator biting into this little shield lizard would be in for a tough chew. Scutellosaurus was one of the earliest known ornithischians, whose jaw was particularly well-adapted for cropping leafy plants. Back inside the cheeks were teeth for cutting and chewing its favorite vegetation, which was probably soft, fleshy and low-growing. It was descended from small bipedal ancestors, and could walk only on its hind legs, but because the heavy scutes of body armor made its body heavy at the front, it undoubtedly walked on all four limbs most of the time. Scutellosaurus possessed a small head compared to the size of its body, with a short skull and a very long tail twice the length of its body and head. Its thin hind legs were much longer than its arms, and the toes and fingers bore small, pointed claws. TIME - 208 - 200 MYA, Early Jurassic period. DIET - Various plants, seeds and fruits. SIZE - Averaged 4ft (1.2m) long. Jurassic Period, Dilophosaurus, Scutellosaurus, 8.5" x 11"
Jurassic Dinosaurs. Dilophosaurus & Scutellosaurus are printed on premium glossy super "B" photo paper. Art Picture 8.5" x 11"
Dilophosaurus, Scutellosaurus, Art Print, 13x19"
Dilophosaurus wetherilli. Scutellosaurus. Printed on premium photo quality super "B" paper 13" x 19". Original oil painting by Josef Moravec. The painting is in the dinosaur art collection of Dinosaur Corporation. Size 20" x 16". Jurassic Dinosaurs! Jurassic period - Dilophosaurus wetherilli, Scutellosaurus lawleri. Dinosaur fine art picture in 14" x 17" Museum Quality Frame with Double Matted in Glass.